Time. Progress. Change. Ali'iolani Hale, our Hawaii Supreme Court, opened in 1871. For over a hundred years, it has accused criminals come and go, among some of the most infamous, Thalia Massie and Myles Fukunaga. It's still a working courthouse with offices and staff but what of the past remains? Perhaps the ghosts of murderers and the murdered return to tell their side of the story? Take a trip of the macabre into the halls of the old courthouse! We meet in front of the Kamehameha Statue. Saturday, October 7th from 7 pm to 9 pm. Pre-Halloween special! $20 per person! A personal guided ghost tour of the courthouse museum where we discuss the Fukunaga and Massie cases and more! 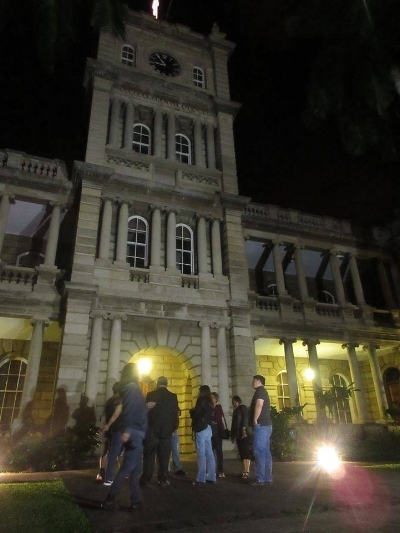 Ali'iolani Hale - Mysteries of Hawai'i pre-Halloween special tour!